I may have double posted, we shall see. Anyways, so yeah I did a paint over to illustrate a bit of PKD’s point in regards to using refence and concepts. When I have an idea I usual do a quick 3D concept (usually in 3Ds max) then take the camera angle I like and bring it into photoshop and just grab pictures from the net and through them to create anything (textures, structures, points of interest, etc). You get a lot of happen accidents. Plus its a fun way to procrastinate from actually getting down to full modeling ;). Good job so far with the additions! I hope you are seeing how each addition moves your art along the path to actually getting into the gallery. thanks, but i was going for a glacier type island. You mean the fortress on a glacier? Thats technically not possible as the glacier is always moving downstream. I like joesomerville quick concept very much, you can think about explored his idea, if you are not to determined on the glacier theme. You can always made the fortress beside a glacier. I would say also, do not focus on details & texture & black out the main blocks, in 3D maybe, then do quick paintover or slam some images from the net to get a feel. I agree the Glacier idea doesn’t really work. On top of that, making ice look realistic can be a challenge. So before we help you with the mountains, what program are you using? Do you have access to a sculpting program? I am being doing traditional art for 20 years and when I do 3D work (and a lot of traditional work) I use a ton a reference (collecting reference images is my guilty pleasure!). So again I agree with PKD, no matter what level of artist you are you need reference of some type. So collect mountain references. study them from all angles. Or you don’t have the time, mash some pictures together (like my paint over) and match that. If I were making these mountains, I would probably sculpt them in mudbox or zbrush. After of course collecting a crap load of images. Again you have all the basic elements in the scene, and your modeling is definitely there. Now you just have to refine it, no need to add more to the scene, just concentrate on making what you have a little better. Keep up the great work! thanks for the replies. i did started searching for references e.g., buttress, castles, fortress etc. and i think i should do the mountains on zbrush or mudbox. using 3d max and the only sculpting tool is the paint deformation in the polygon panel. well this is another update with a new mountain under the fort made in zbrush(first time using). for comparision left the side mounts on the entrance unhided. thanks for the zbrush advice. Maybe there are too many counterforts? Maybe 2 would be enough. There’s still a problem: the frontal wall with entrance could be more interesting. Maybe think about adding some more variety to it, adding some sculptures and other stuff. ya i know. but wanted to know if the fort mountain is better or not. Forget about the texture, concentrate on the modeling first. ‘The humps’ on the mountain are unnatural. Mountain Rocks need to be hard & sharp. I believe you can find some good tutorial on rock like structure in Zbrush. thanks but now i m working with zbrush for the first time so will get used to in time. BTW thanks for the tutorials. Cool man, Things are really shaping up. I think the blocks on the towers could be smaller, and the people could be larger. The waves on the water seem to large and flat. Maybe you could increase the frequency on the waves. I’m not keen on the keep design. It doesn’t really match the gate. It could look better with large towers on the corner. The composition could use some work. It might look slightly better more pushed in with a wider angle shot. Try placing the camera closer to the water and aim it up. thanks for the reply. will try to do what you said. but do the mountains look alright? The mountains can be more blunt/sharpen still, but is a vast improvement. I personally think the 2 towers & the wall between are holding the overall quality of the image. If you ask me, I will advice you to scrape them & start new. 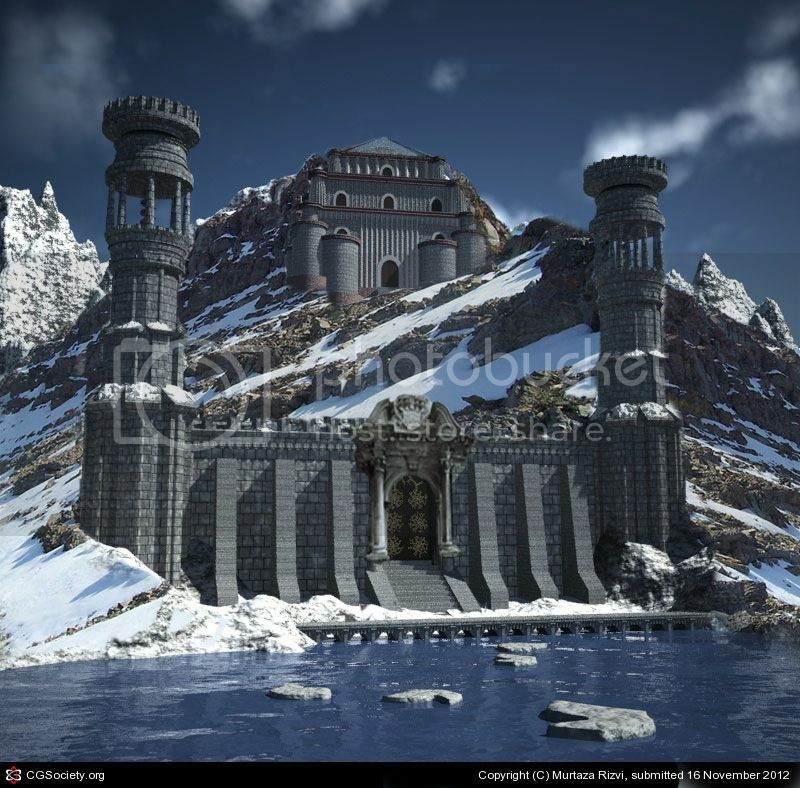 well i re rendered the scene with a wider shot and larger fort. and PKD do you mean to rebuild the front so that the fort should emphasis? It might be a good idea to make some sketches to get the final composition worked out. Things are being moved around, but I don’t think the image is really improving much. Try making a rough sketch of your vision for this project. Even if its just boxes and lines, it would be easier to dial in the composition and content that way. :p.
Think about the style of the architectural, Gothic, medieval, etc. Think about the functions; e.g, what is the purpose of this tower, for defence, or an observation post. Use the function to shape the design. When form fit function, normally, you get better results. How do people get from the bottom to the top building, once you get the details thought out, the design will be more natural. Like I mnetion before, & AJ1 have said, stop moving things around, & stretch out the design.